The Inglesina Classica Pram is an heirloom quality pram par excellence, with an unmistakable romantic and traditional style. Crafted of prime quality materials for elegance that doesnt age. Artisan manufactured with a classic wooden structure. Add the optional stroller seat with hood to convert this classic pram into a elegant stroller when your child gets older. The Inglesina Classica pram comes complete with an elegant diaper bag of the same color. The Inglesina Classica is more than a pram: it is a symbol, a never-ending myth. This is demonstrated by the fact that Inglesina has been producing it for more than forty years practically without modification from the aesthetic point of view, with its unmistakable English style, although it has been updated to meet current strict quality standards in terms of safety and comfort. 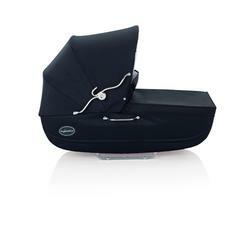 This pram is handicraft manufactured with quality materials, extremely accurate in all its details. THe Inglesina Classica is the ideal pram for long walks in the city and for those who want to have an exclusive pram to admire and be remembered.